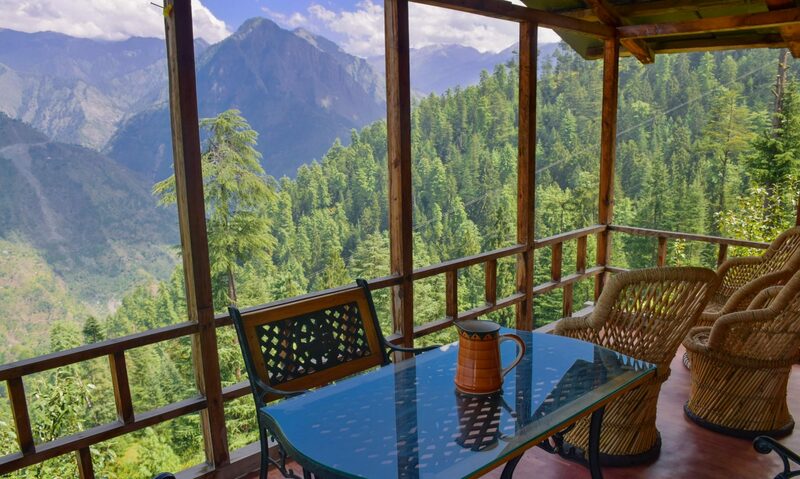 Overlooking the Tirthan valley, just front of the Great Himalayan National Park, perched on the edge of a forest covered mountain, the Tirthan Eagle Nest is a haven of peace, in a unique environment. Build in local stones in the middle of apple orchards we are a real homestay with only two comfortable bedrooms for our guests. We are like your family, not like your staff. 🙂 You stay with us to share a bit of our Himalayan life ! The Tirthan Eagle Nest is the best choice for those who wants to escape the civilisation and to rejuvenate in the pristine Himalayan Nature, in a very comfortable and family way. We also run Himalayan Ecotourism, a reputed tour and trekking company which is a social enterprise working in the ecozone of the Great Himalayan National Park. We have a lot of fascinating stories to tell you ! Well, a small road ends 150 meters below. How peaceful is our place ! The Tirthan Eagle Nest homestay is located in a small Himalayan village just front of the Great Himalayan National Park at an altitude of 2000 m above see level in the Kullu District of Himachal Pradesh. Lying amidst apple orchards, very close to dense Deodar forest we are a haven of peace in an exceptional natural environment. Our position 600 m above the Tirthan river offers a unique view of the entire Tirthan valley, from the Shrikhand Mahadev snow-capped peak to the Beas river. And so we called our homestay the Tirthan Eagle Nest. We are a real homestay with only two double rooms available for our guests. The beds are king size and can then accommodate a child with his/her parents. A single extra bed can be arranged in the rooms. Bathrooms are attached to the bedrooms. The house is build in stones and the interior work has been done with wood and cob. This ensures a very sane and pleasant atmosphere inside. You have free access to the dining room, the living room, the wooden balcony and the organic garden. You can also enjoy our rich books library, our board games, our Spanish guitar and our digital piano. We are proud to say that our homestay has no AC (not required) and no television (just watch from the window to see the living nature). Feel like at home. We are cooking healthy food that we are all sharing, including our children. Traditional Indian food is what we do best here but on your request we can also cook some European food with herbs and real cheese. For the non-vegetarian we can cook mutton or local trout fish from the Tirthan river (200 INR extra per person for the trout fish). We avoid chicken as the Indian chicken industry has become something that goes beyond the limit of our ethics. Breakfast are continental or Indian. Please communicate your preferences at least two days before reaching. Firstly you will have to reach the small town of Banjar. You will find extensive information about how to get to Banjar in our tour and trekking website here. After crossing Banjar on the way to Jalori pass you will need to drive 4 km and then take a left turn on the way to Shringa Rishi (sign). You can’t miss it, there is only one and it is a “pakka” road. After 4 km again, the road ends, you have reached. You can park your car and we will help carry your luggage to the house which is 150 meters away from the road. Another easy way to find us is to follow the Tirthan Eagle Nest on Google Map with your GPS-enabled smartphone. You are coming with public road transportation, with your own car or by flight to Kullu, please check this Himalayan Ecotourism page to know in details about how to reach us.